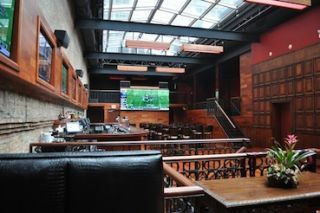 Encompass Technologies just completed a major sound and video installation for the sizeable new restaurant/sports bar/nightclub, John Barleycorn River North in downtown Chicago. The fast-growing integrator had worked on a host of other venues for owners Sam Sanchez and Michael Gonzalez. As Tim Pickett, principal for Encompass, explains, “There are four John Barleycorns and we’ve been involved with all of them, two from the ground up and two complete rehabs. Sam and Michael also own two Moe’s Cantina clubs that we worked on. “For John Barleycorn River North, they definitely raised the bar several notches with a substantial budget of $285,000,” said Pickett. “Unlike the club in Schaumburg, where there was a focus on live sound, John Barleycorn North functions as a sports bar and restaurant during the day and becomes a nightclub with a DJ upstairs that can hold up to 1500 people on Friday and Saturday nights. “The audio system had to be very versatile so they can turn it up late at night for that nightclub sound and feel, while providing more controlled sound levels for the sports bar patrons so that everybody can hear it the same way. “Martin Audio was the obvious choice,” Pickett said, “because the owners had the speakers in their other clubs and were very happy with the sound and performance. We used 32 AQ28 cabinets throughout the club along with six AQ212’s, four AQ215’s, three F12’s and Martin Audio MA 4.8Q and 6.8Q amplifiers. Two Symetrix Jupiter 8 systems provided turnkey audio processing. Designed to provide the ultimate in sports viewing, the video system includes 12 Cima 46-inch LCD and 24 Tovis 46-inch LCD Ultra Narrow Video Wall Panels, 35 Samsung 60-inch Plasma Panels, two Samsung 46-inch LED Panels, and a Sharp 80-inch LED Panel. The complex video switching system for both floors includes one Knox Chameleon 16X64 HD Matrix upstairs and one Knox Chameleon 16X32 HD Matrix downstairs with a Knox Touchscreen control system that functions via iPad. The whole project took about fourteen months from start to finish, and the club has been up and running for about three weeks. Asked about the installation, owner Sam Sanchez commented, “I've always been really impressed with Martin Audio. We've been using the brand since 2008 at our locations. What’s great is, that at any level, the sound is clear and intelligible. It works if you’re watching the game, or partying the night away. Encompass has done a great job installing the systems and making them just right. I really love that I can call them 24 hours a day any day for tech support."